We do so many vehicle jobs that it is nice to do something a little different every once in a while. 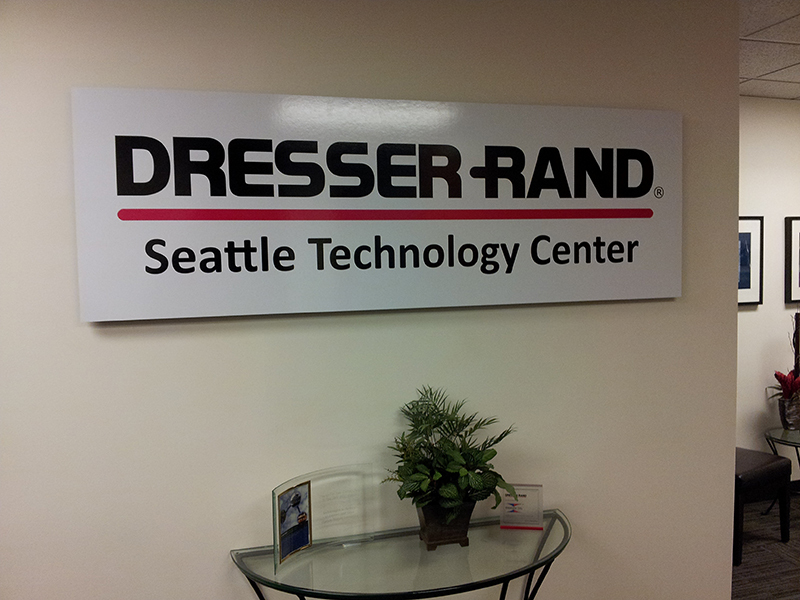 This logo is digitally printed, applied to 1/2″ black acrylic and then laser cut. The laser cutting is key to being able to get such fine detail and sharp corners. Normal routing would not have come out this sharp looking. Then we mounted it to the wall with double sided adhesive tape. I think it looks awesome and so did the customer. 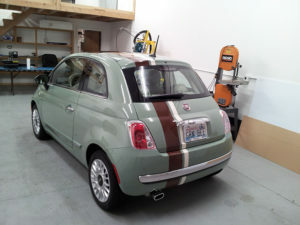 We were contacted by Fiat of Kirkland to do some custom Striping and a Fleur de Lis design for one of their customers. It was decided the Matte Black would be a good look for this project. After designing the Fleur de Lis for the hood, we incorporated it into the side stripes. Their customer really liked the look, so we went to work. 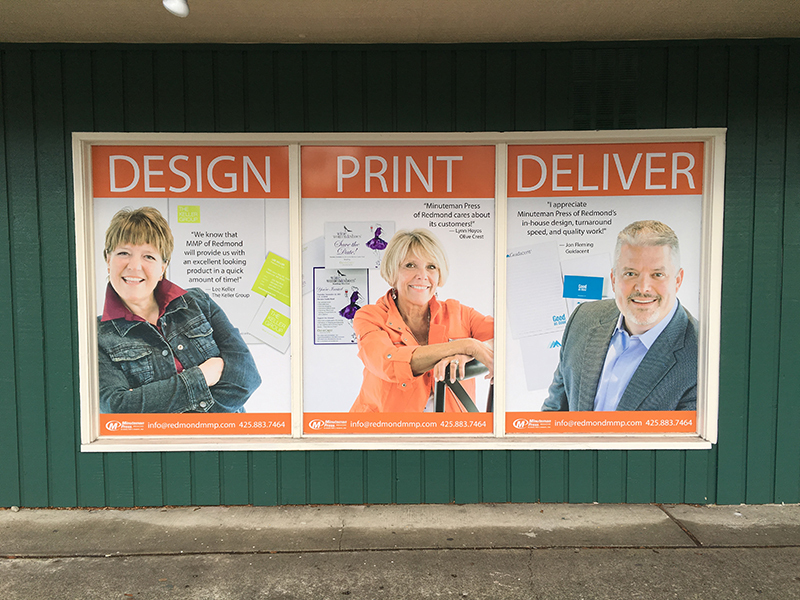 Today we were out putting new window vinyl up for Minute Man Press of Redmond, WA. They had 4 windows that they wanted to advertise with, but didn’t need to see out of. We used 3M IJ35-10 vinyl with a clear over-laminate. Using an intermediate vinyl saved the customer money (which they liked) and it was also a little thicker (which made it easier to install and we liked that). Quality Towing asked us to make new reflective graphics for their two new flatbed tow trucks. Here are the first two flavors of the new Swerve franchise vehicle graphics. This week we had a new type of vehicle for Bob’s Heating and Air Conditioning. We wrapped 2 of the new Ford Transit Van’s with High Roofs. Sometimes integrating a new vehicle type into an existing fleet can be difficult. But I think we did a pretty good job with these. We also did a very busy, but interesting wrap on a 2015 GMC Acadia for Logo Unlimited. Here are few projects from this week at JJ Graphics & Signs. 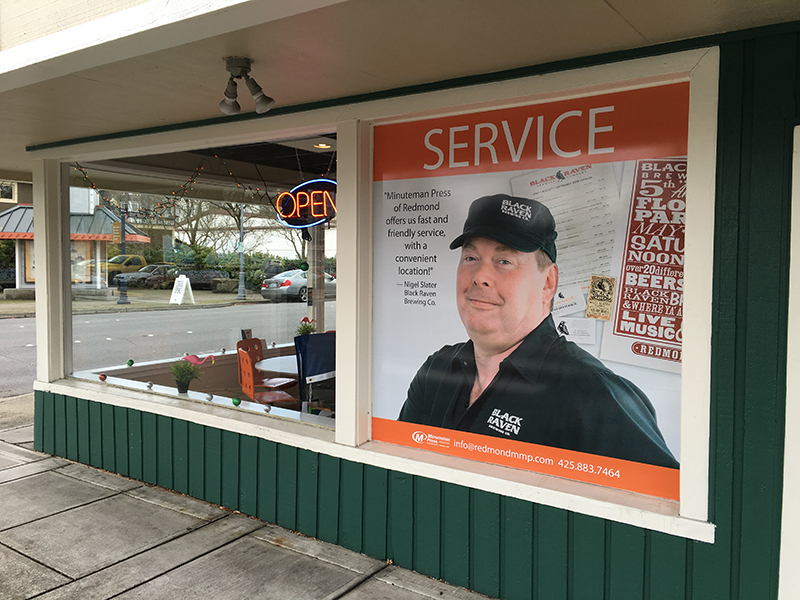 We designed and manufactured a really nice A-Frame sign for the folks at Earth Pet. I think the colors came out great. Next up we got some vinyl stickers for Buccaneer Mining Company. With the Tuff-Cal extra thick clear over laminate these stickers will be ultra durable and last 5 – 7 years out side. 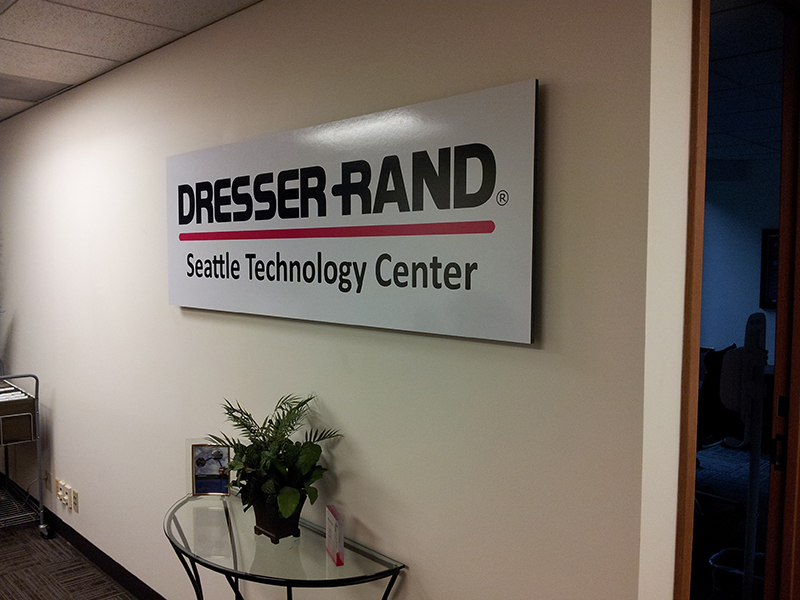 Finally we made a 1/2″ thick Gator foam sign for Dresser Rands new location in Bellevue, WA. We used 1″ stand offs to give it the look of floating off the wall. One of our local State Farm insurance companies needed new acrylic sign faces for an illuminated sign. 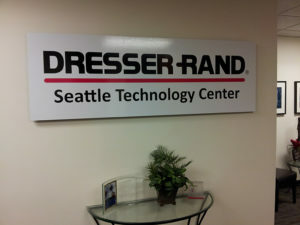 There are a couple ways to make the logo and lettering for an illuminated sign face. 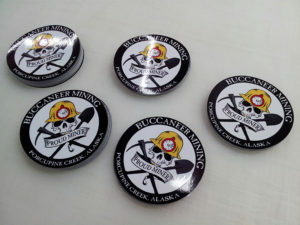 The first is to use pre-colored translucent vinyl and cut the logo and lettering from two different colors. They would then be put together on the acrylic sign face. The second choice is to print the entire face on translucent printable vinyl, cover that with a matte clear over-laminate and then mount them to the acrylic. As you can see from the photos we chose to go with the second option. This is a more cost effective choice for the customer and it will save on labor charges if they decide to reface the acrylic with new graphics in the future. 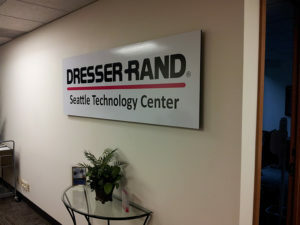 Mounting digitally printed translucent vinyl to acrylic sign face. This is some truly impressive software. We use the very software they are talking about in this video. It’s just not this cool yet. 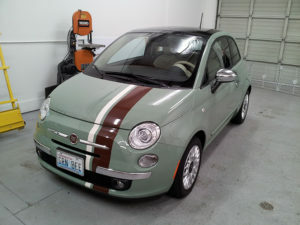 The owners of this car were referred to us by Fiat of Kirkland. 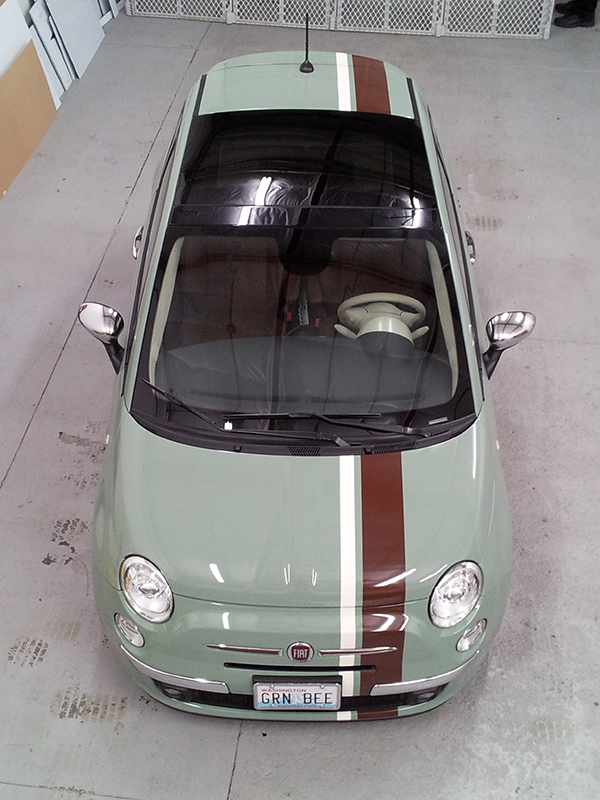 They had just purchased this green Fiat 500 and wanted to personalize it with some racing stripes. So Wham! Here it is!